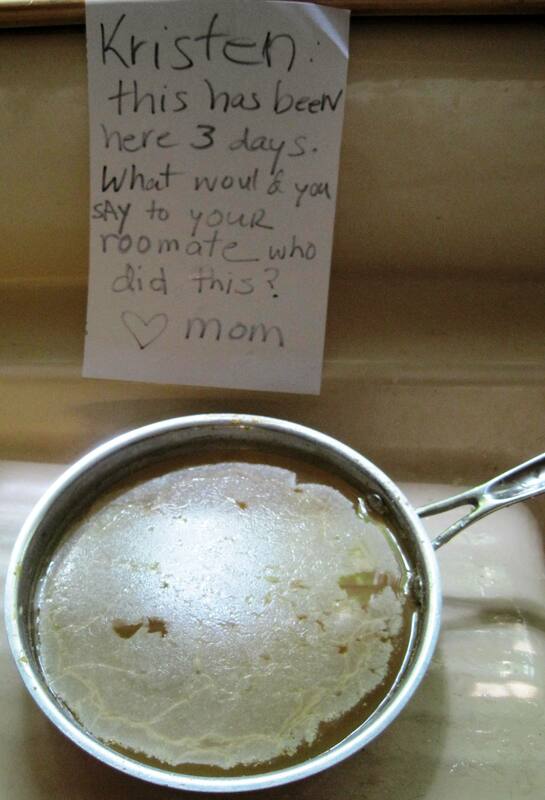 After three days, dirty dishes start to stink. Good thing it's warm enough for the windows to be open. After Tanyetta’s comment on previous post, I realized maybe it wasn’t clear to Kristen that it was her pan and her mess. So I revised the note while she was gone for Memorial Day weekend and debated whether or not to clean the pan myself. I decided the message, and odor, were stronger if I practiced patience. Upon returning, Kristen saw the note, immediately cleaned up the pan without further prompting, and apologized. “I was going to do it before I left on Friday night, Mom, but I forgot,” she said. An apology — from parent or young person — goes a long way in preserving family relations. Cleaning up without further reminder goes a long way in preserving roommate relations. Not nagging, using notes, saying nothing, and waiting go a long way in parent-child relationships, especially with teens and those college-age young people who drop in and out for several years. She’s leaving Saturday for a five-week post-college graduation trip to Malaysia, so I remind myself to treasure the time I have with her. It seems impossible she grew up so fast. This entry was posted on June 1, 2010 at 9:52 am and is filed under chores, Encouragement. You can subscribe via RSS 2.0 feed to this post's comments. Both comments and pings are currently closed. Oh! I completely understand now. I was lost with the first note! Wishing her well on her trip. I like the second note much more too. It’s clearer and less emotional. Thank you for taking time to make some nice comments on entries over at my place. When I popped over to see you I laughed at the photo! I laughed because I thought I had come home to MY kitchen! I’ve enjoyed reading your entries. As mom to one post-college-graduation daughter and an Army Wife who will be relocated shortly, I agree in making the most of whatever time is left…good or bad! LOL- the universality of roommates is scary.